One of the most important among the festivals of India, Sri Krishna Janmashtami is the birthday of Lord Krishna, who is the avatar of Lord Vishnu during the Dwapara Yuga, the third era of Indian mythology. If you are thinking when is Janmashtami, it falls during late August or early September, the lunar month of Shravana according to Indian calendar. Lord Krishna is god to most Hindus and they commemorate his birth with great joy. 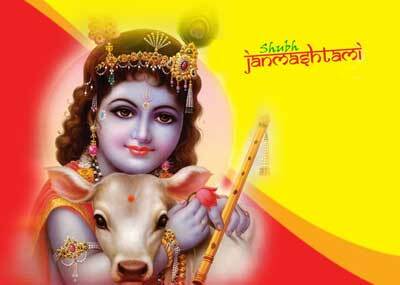 You can use Yoovite.com to invite your friends and relatives to the Janmashtami festival at your home. You should decorate your home for the Janmashtami festival. Special puja decorations are common during this day. This is a way to invite Lord Krishna to the individual homes in a grandiose way. Further, good decoration creates the right ambiance for celebrations. You should clean your home and decorate it with flowers and other items. You should pay particular attention to the ‘puja ghar’ and also the kitchen and the drawing room. The other items that you can use to decorate are the idols and sculptures of Lord Krishna. These are the prime decorative pieces for the festival. Wall hangings of Lord Krishna can be used as decorative items in addition to the idols. Embroidered cloth panels are also popular in this festival. You can decorate the entrance of your house using appealing door hangings that come in bright festive colors and are adorned by multicolored glass beads, golden globules, shining mirrors and fancy motifs. Those who know about Krishna god are aware that the most popular symbols for Janmashtami are the flute, peacock features, pots with butter and cows. You can put the idol of baby Krishna in a cradle and decorate it with flowers and jewels. You can blow the conches at midnight to symbolize the birth hour of Lord Krishna god. 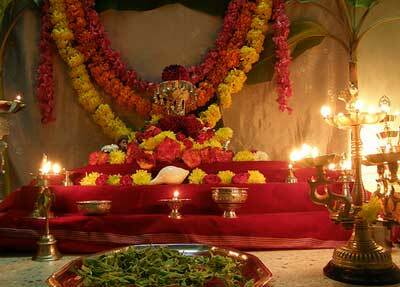 Further, the deity is invoked by offering milk products in addition to flowers. Having vegetarian food is another part of the festival. You don’t kill animals on this day and make sure that your guests know about the cuisine being vegetarian. However, you can use milk to produce sweets and other dishes such as payasam. It is usually a small function in your house and hence you don’t have to invite too many people. Just call your closes relatives and friends. Watch some good movies on the day with the guests or take part in some games such as antakshari or small drama with the children etc. Janmashtami is not just as festival. It is the time to rejoice in the glory of Lord Sri Krishna and his achievements. Gifting your friends and relatives is a primary aspect of the festival. This will appropriately convey your feelings towards your friends and relatives and show respect and care to your elders. The gifts on this day can vary from idols and sculptures to gift hampers, puja accessories to dry fruits. The holy Gita is a very popular gift during the festival.